Front view of Al-Hakam II's mihrab, at the center of the back wall of the 2nd expansion of the Great Mosque of Cordoba. 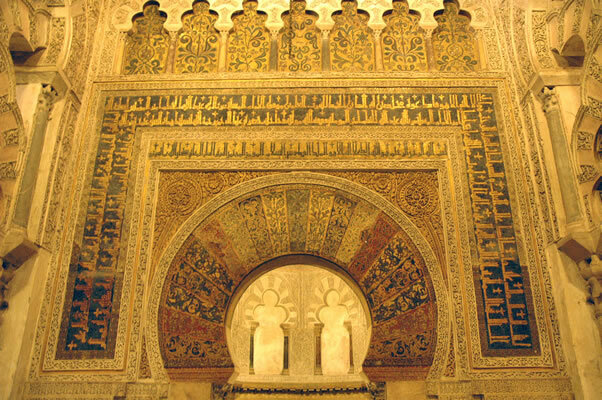 The mihrab had been moved twice previously, as the Mezquita expanded to the south. Columns from the previous mihrab were re-used. Almanzor's later expansion to the east would put this jewel of the Ummayyad Caliphate out of center with the rest of the building, but to demolish it and build a new one was out of the question. The inscirption in large letters reads: "(Allah) He is the knower of things hidden and manifest. He is the powerful one, he that is full of pity, the living one. There is no other god than him. Invoke him offering him a pure heart. Praised be Allah Lord of the Universe. Blessed be Iman Al-Mostainsir Bil-lah, favored by Allah, and the servant of Allah, Al-Hakam, Prince of Believers. Make him prosper, Allah, for the work of this sacred temple, which exceeds all other memorable constructions in its size, comfort and adornment. And the construction was concluded by his virtue and command. The blessing of Allah be upon Mohammed. And the peace. - The Iman Al-Mostansir Bil-lah, servant of Allah, Prince of Believers (May Allah favor him) commanded his freedman and Hachib Chafar-Ben-Baderraman (mercy on him Allah) carry out the construction of this temple and it was finished with the help of Allah under the supervision of Mohamed-Ben-Tamlih, Ahmed Ben Nasar, Jayd-ben-Haxim of the prefect's guard and of Motharrif." Nearby, another inscirption reads: "In the name of Allah, the Merciful. Praise to Allah, who guided us to this place; we could not have been guided if it had not been by Allah! For this reason was sent the legate of our Lord with the truth. He commanded the Iman Al-Mostarsin Bil-lah, the servant of Allah, Al-Hakam, Prince of Believers (Allah protect him), his freedman and Hadrib Chafar Ben Abd-al-Rahman (may Allah be pleased with him) to add to these, and this was built with the fear of Allah and with his aid. This was concluded in the moon of Dhu al-Hijjah of the year four and fifty and three hundred." (Hijri calendar: year 354, Justinian: 965 AD). [source: Orti Belmonte, p.26].